Preheat oven to 375°F. Roll out Pillsbury™ French bread on a lightly floured surface into a long rectangle at least 14 inches long and 8-10 inches wide. 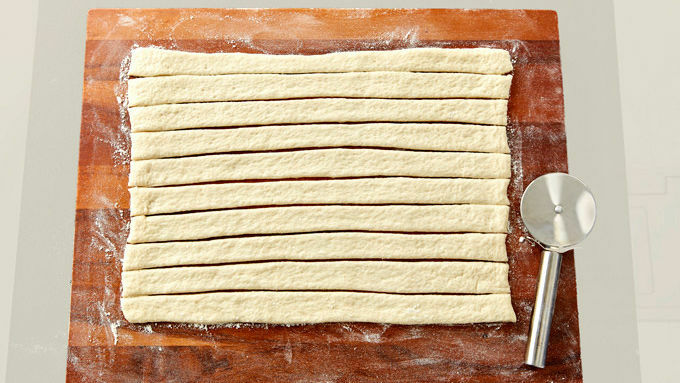 Use a sharp knife to cut the dough into seven long strips. Transfer the strips to a baking sheet that has been lightly oiled. Fold back every other strip. 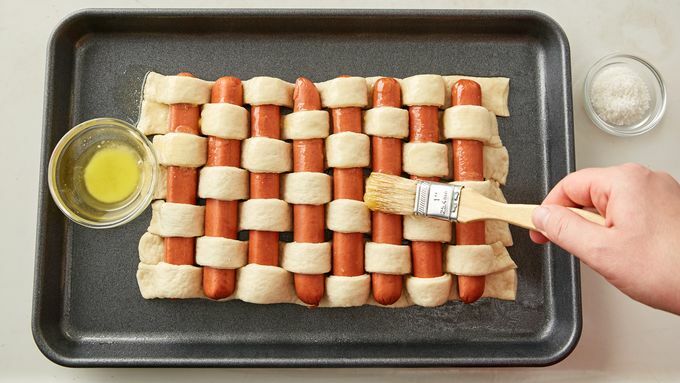 Place a hot dog on the flat strips, then place the folded strips back over the hot dog, starting a weave pattern. Next, fold back the other strips over the hot dog and place a second hot dog down. Continue to weave all eight dogs into the bread in this fashion. When all the hot dogs are woven into the dough, trim off any extra dough from the edges and try to space out the dough evenly over each dog. Then brush with melted butter and sprinkle with coarse salt to give the bread a pretzel taste. Bake the weave at 375°F for 25 minutes until it's perfectly browned. Let the weave cool for 5 minutes and then chop it into eight squares. Serve with ketchup and/or mustard. Use the thinner, longer hot dogs if possible. The really thick ones will be harder to weave into the bread. 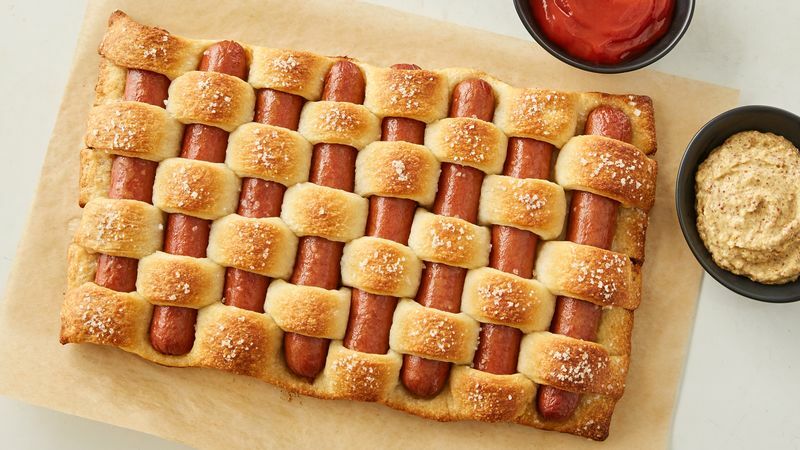 Weave a blanket of bread threads around some hot dogs and watch mouths drop with surprise! 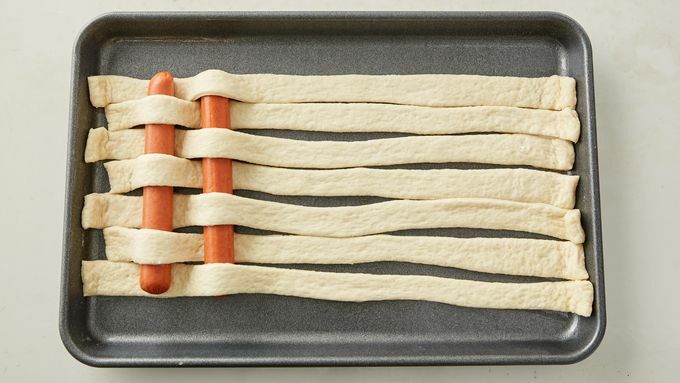 These things might look complicated, but I guarantee it’s a recipe you could make with kids. And I promise kids (and adults!) will want to eat them. 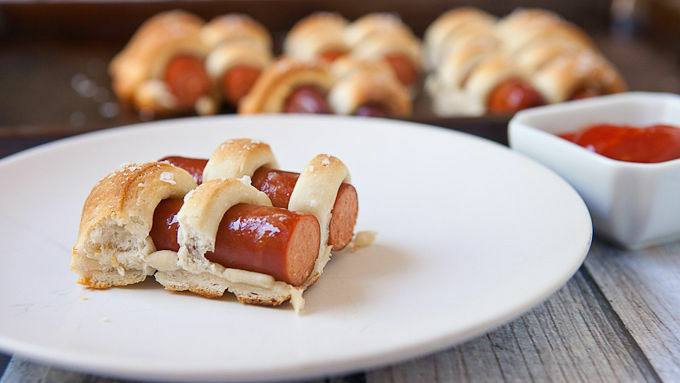 It’s really hard to wrong with hot dogs baked in crispy dough, after all. 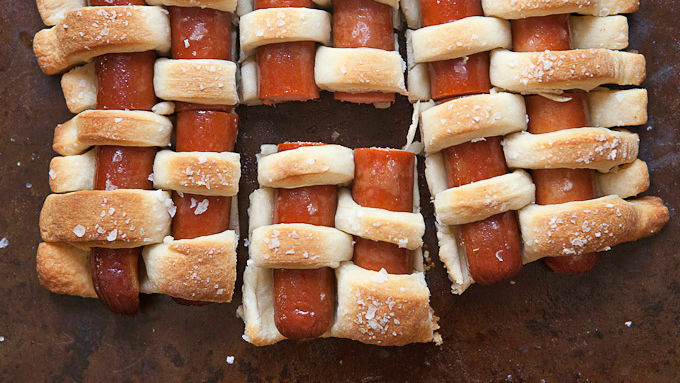 That’s why these hot dog weaves are the best thing on the internet today. Let’s talk dough and dogs. For the dogs, use the long variety of hot dogs, not the fat ones. That will make the weaving easier later. For the dough, Pillsbury refrigerated French bread does the trick. Serve it with ketchup or mustard. If you’re feeding a group, this is almost easier than making actual hot dogs. The weave is where it’s at!